Enjoy our high level transfer services to/from Agios stefanos and we promise you the best transport prices without waiting at airport, port, station and without hidden debits. Since the 2011 local government reform it is part of the municipality Dionysos, of which it is the seat and a municipal unit. 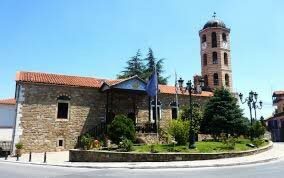 Agios Stefanos is situated in the hills in the northeastern part of the Athens conurbation, at about 350 m elevation. It lies east of the Parnitha mountains, northwest of the Penteliko Mountain, and 4 km southwest of the Marathon Reservoir. The source of the river Kifisos is near Agios Stefanos. It is 9 km west of Marathon and 21 km northeast of Athens city centre. Its built-up area is continuous with those of the neighbouring suburbs Anoixi and Stamata to the south. Agios Stefanos has a railway station on the railway from Athens to Thessaloniki. Enjoy our high level transfer services to/from Agios stefanos and all over Greece and we promise you the best transfer prices without waiting at airport, port, station and without hidden debits.